For regular flights many airlines use "Boeing 737-300, 737-400, 737-500" aircrafts. These aircrafts operational NDT is carried out in accordance with the manual of "Boeing" company (NDT Manual for Boeing 737), where methodical recommendations are given for each block, in particular: requirements for devices and eddy current probes (ECP), scanning trajectory, calibration blocks with artificial defects and signals received from defects and interfering factors by means of calibration blocks. The following are the examples of "Boeing" company testing methods implementation with a new EDDYCON C eddy current flaw detector and specially designed ECPs. This eddy current flaw detector EDDYON C (Fig.1) was designed to be really easy-to-use hand-held instrument possible to be operated only by single (for example left) hand with Eddy-current probe for inspected surface scanning in the another (for example right) hand. The form of the instrument case is very comfortable and realizes optimal weight distribution on the operator palm. Thus, EDDYCON C flaw detector is very portable (230х135х 98 mm) and light (0.9 kg) device with an easy-to-use function keys and independent power supply, making it particularly suitable for use in airfield conditions. The flaw detector is equipped with a bright 3.5'' color display with 320×240 pixels image resolution. The instrument side-strip menu is easy understanding by experienced operator. Main memory capacity and clock frequency of CPU is 256 MB and 800 MHz respectively. High-power software and integrated circuit logic allow applying the efficient algorithms  for the signal processing. The table below shows some specifications of the flaw detector EDDYCON C.
Thus, despite the small dimensions and weight, the flaw detector EDDYCON C has features and capabilities that are not inferior to the best foreign more overall instruments. A large set of various ECP types is designed for the flaw detector EDDYCON C.
High-frequency ECPs are applied for surface fatigue cracks detection in fuselage skinning, wig and empennage, strength structural members, wheel hubs and etc.. Thus, developed several ECP constructions, which due to the variety of shapes, simplify the ECP access to the testing zone. In particular, special-purpose ECPs are designed for the surface cracks detection on the tapped surface of the countersink rivet hole. Furthermore, variants of shield ECPs are designed for the testing zone expansion in the hole edge of ferromagnetic bolts and etc. Fig.2 shows the procedure of aircraft wheel hub testing using L-shaped high frequency ECP. Ferrite cores of 1.1 mm are used in high-frequency probes allowing reliable detection of 1.5-2.0 mm length surface cracks. The flaw detector is provided with a separate Lemo 00 connector for the local high-frequency ECPs connection. The flaw detector sensitivity with high-frequency local ECPs checked on calibration blocks of 126, NDT 1048, 188A type of American company "NDT Engineering Corporation", made of 2024 aluminum alloys with defects of 0.38-0.51 mm depth, also on calibration blocks of SOP 5-1, SOP 5-3type with defects of 2.0 mm length and 0.2 mm depth (for aluminum alloys) and 0.5 mm (for titanium alloys and ferromagnetic steels). Test results have verified the flaw detector high sensitivity to surface cracks in various structural materials. Besides, "EDDYCON" flaw detectors are equipped with selective multi-differential ECPs that are efficient at defects detection in inner layers of multilayered blocks . The flaw detector was tested for the operational defects detection in various hubs zones of aircraft wheels (Fig.2-4). For the wheels of fillet transition zone testing multi-differential ECPs of MDF 0701 type were used, providing high sensitivity of testing with a good turning out from the gap changes. According to in-house testing technology two scanning types were used for the wheels hubs fillet transition zones: circular and zigzag (Fig. 3). Herewith, ECP of MDF 0701 type ensured the necessary sensitivity with the gap up to 2 mm appearing during wheel flange gouges testing. Fig. 3. Scanning schemes during wheel hubs fillet transition testing. Fig. 4 shows the signal from fatigue crack in the fillet transition zone of 30 mm length and 0.5 mm depth detected through the lacquer coating. The crack was detected at circular scanning and verified by the zigzag scanning. Used operating frequency is 420 KHz. Calibration block with electric erosion defect of 0.1 mm depth was used to set the defect circular alarm frame. Fig. 4. Signal from fatigue crack detected in the wheel fillet transition zone. Next section describes testing results of wheels hub holes after removing the screw bolts. Fatigue cracks detection on the holes side wall in dynamic mode. During aircraft blocks operational testing attention is paid to the holes zone for rivets set referring to critical zones since they are the structural stress raisers. To improve defects detection productivity on the holes side wall the flaw detector is equipped with a rotary scanner of SVR type (Fig.5) and has the required filters` parameters . Examination of ECP for the holes testing was carried out using calibration blocks of NDT 1016 type of "NDT Engineering Corporation" company with two angular defects such as cracks (Fig. 5 b). Defect No.1 has a length of c = 0.51 mm and a depth of b= 0.51 mm. Defect No.2 parameters c and b are equal to 0.76 mm (Fig. 5c). In Fig. 5d there are signals from the calibration block smallest defect (defect No.1 in Fig. 5c), which show the high sensitivity during holes testing using flaw detector EDDYCON C good signal / noise ratio. Fig. 6 shows the procedure of wheels hubs bolt holes testing in dynamic mode after their dismantling (a) and the flaw detector signal received during the fatigue crack of 0.56 mm depth (b) detection. Fig. 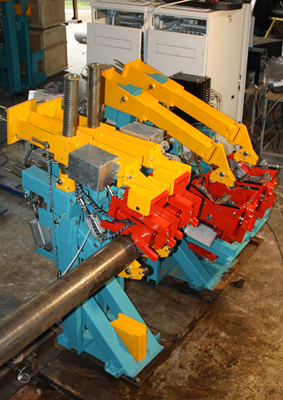 7 shows the procedure of pressure bulkhead fastener holes testing. Fig.7. Detection of pressure bulkhead fastener holes defects using flaw detector EDDYCON C and rotary scanner. Detection of internal defects of multilayer blocks in rivets zone. In many cases it is assumed to provide testing without removal of rivets which require more complex interpretation of testing results, since it is necessary to separate the signal from the crack from the rivets signal, which, in essence, is also a material discontinuity. Application of various technologies for rivets zone testing is assumed for the different aircraft parts of Boeing company. 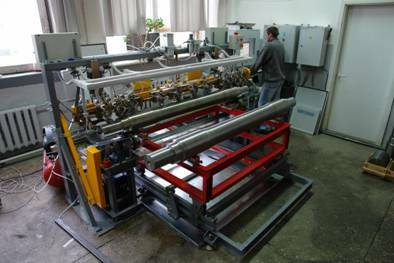 Traditionally the static mode is applied for this task using ECP of a ring type or a more efficient method of testing is applied using sliding ECPs . Special ring ECP of ARK 2/8 type is designed for the back pressure bulkhead testing in the zone of its fastening to 'Y'-chord on the inner row of rivets higher the stringers 15L - 15R. The ECP provides detection of cracks of more than 5 mm length in the second layer of a two-layered aluminum alloy structure (layer thicknesses are of 1.8 and 0.8 mm) in rivets zone with a head diameter of 8 mm. To set up a ring ECP the sample of two plates of an appropriate thickness (Fig. 8a) is used. The sample has a rivet without defect (defect-free in Fig. 8) for the defect detector balancing and with the defect (with defect in Fig. 8), made by electroerosion method with the opening of 0.1 mm, length of 5 mm, corresponding the sensitivity testing given in the manual of the Boeing company. ECP signals were investigated at the operating frequency of 6 kHz. At the operating frequencies from 2 to 4 kHz, which are recommended by the guidance of the Boeing company, signals have a similar appearance. During the flaw detector setting the vertical gain is set at 12 dB more than horizontal, allowing better allocation of signals from the defect (Defect in Fig. 8b) at placing the ECP on the rivet (Fig. 9). Signals from the defect correspond to the signal transition from the balancing point without defect to the defect point (Fig. 8b). Signal hodographs from the gap changes (lift-off in Fig. 8 b) for defect-free and defective rivets are oriented in the horizontal direction. Designed ECP such as ARK 2/8 differs from standard ring ECPs by the significantly lower height (9.5 mm –for ARK 2/8 versus 25.0 mm for ring ECP of Rohmann company). This allows placing it on rivets in hard-to-reach areas of pressure bulkhead [3, 4]. Detection of internal defects in the five-layer blocks with a sliding ECP. The most difficult task is cracks detection in rivets zone of hidden type without their remove. This problem arises when testing multilayer covering near the doorway of aircrafts "Boeing 737-300, 737 400, 737-500" in a cuts zone under the door hinge fittings. The difficulty consists in necessity of cracks detection that may arise and develop from rivets, at a depth from 3.6 to 6.1 mm in different layers of five-layer one-piece block with a total thickness of 13.68 mm. Cracks develop perpendicular to the riveted joint. Defect location in the 4th layer of calibration block is shown in Fig. 10. Testing results interpretation technique should provide a reliable separation of signals from the cracks of the signals received from defectless rivets, as well as to exclude other interfering parameters, for example, the impact of changes in the gap. To solve this problem a sliding ECP version of absolute type was developed operating in a range of operating frequencies of 0.5 - 4 kHz . Despite the absolute scheme of ECP construction it is well compensated, allowing to get a good gain throughout the frequencies range. Note, that ECP of such type do not provide detuning from the gap influence. Thus, excluding the gap influence at signals interpretation must be achieved through the analysis of these signals peculiarities in a complex plane. The ECP tests were carried out on the sample of NDT 3049 type of American company "NDT Engineering Corporation" at the operating frequency of 500 Hz. Fig. 10 b shows signals from the crack of 16,5 mm length at the depth of 6,1 mm in a 4th layer of the sample (Fig. 10a). For the selective interpretation possibility assessment in Fig. 10 b there are also signals from defectless zone rivet and gap changes influence. Signals from defectless zone rivet with the complex plane scan are oriented in a complex plane. Signals of gap influence are oriented downward from the balance point. Similar signals are received from defects in a 3d layer of the sample. Analysis of received signals shows the possibility of clear signals extraction from defects such as cracks in rivets zone at a depth of 6mm from the signals of defectless zone rivet and from the gap changes between ECP and tested surface. Tests confirmed that provided techniques of "Boeing" aircraft components testing can be successfully implemented when connecting designed low-frequency ECPs to the universal flaw detector "EDDYCON" . Universal eddy current flaw detector EDDYCON C can be applied for the non-destructive testing of Boeing company aircrafts technologies implementation. Eddy current flaw detector Eddycon C is referred to the testing and evaluation means. 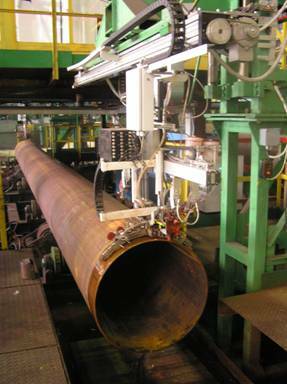 It is intended for manual testing by eddy current technique for the presence of surface and subsurface defects, such as discontinuity of the material (cracks, overlaps, holes, fine cracks, etc. ).